Astronaut Rusty Schweickart, lunar module pilot, is photographed from the Command Module ''Gumdrop'' during his extravehicular activity on the fourth day of the Apollo 9 Earth-orbital mission in March 1969. The Command and Service Modules are docked with the Lunar Module. A camera glitch gave spacewalking Apollo astronaut Rusty Schweickart five of the most profound minutes of his life. 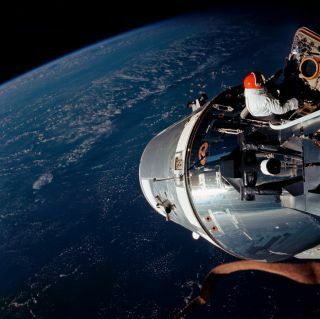 Schweickart, the lunar module pilot on NASA's Apollo 9 mission to low-Earth orbit in March 1969, had just exited his vehicle when command module pilot Dave Scott told him to hang on, Schweickart recalled in a new video about the Apollo 9 spacewalk. Scott was documenting the spacewalk — the first of the Apollo era — from the open command module hatch with his movie camera, and the instrument had jammed. "Jim McDivitt, who's the [Apollo 9] commander, says, 'OK, Dave, I can give you five minutes to try and fix it, and Rusty, stay right where you are,'" Schweickart said in the video, which was produced by the nonprofit XPrize Foundation as part of its XPrize Insights series. "So I figured, 'Hey, great. This is my opportunity to really appreciate what's going on,'" Schweickart added. "So I just let go with one hand, and just sort of swung around, looked at the Earth below and the black space above and the sun over my shoulder. And, I mean, it was this incredible, spectacular view." The astronauts' radio system was voice-activated at the time, Schweickart said, so no sounds intruded upon his thoughts, which went to some pretty deep places. "How did I get here? Humanity has reached this point where we're moving out from the Earth. I'm a small part of that, but that's what's going on. How does that happen in history?" said Schweickart, who was 33 years old at the time of the spacewalk. "Who am I? Am I 'me,' or am I 'us?' It's very clear that you're there as a representative of humankind. This is humanity moving out, and you're just the representative on that frontier." Schweickart has continued to be an influential figure in the space community in the decades after Apollo 9, which marked his only trip to space. In the mid-1980s, for example, he cofounded the Association of Space Explorers. And in 2002, he co-founded the B612 Foundation, a nonprofit organization dedicated to defending Earth against cataclysmic asteroid strikes.